At Foot Specialists of Greater Cincinnati, We offer both orthotic (shoe inserts) as well as ankle braces for various conditions. Orthotics are devices that are reserved only for the shoe, while an ankle brace will extend beyond the ankle to the lower leg. 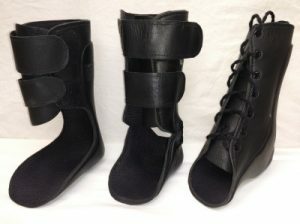 Often times both can fit in a shoe (depending on the style of the shoe), however, it is not uncommon to “shop around” for a shoe to accommodate either device to ensure brace therapy is effective. Often times a good brace and/or insert can address and accommodate a painful condition, especially if it is one that leads to instability or premature fatigue of the extremity. 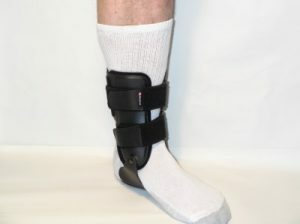 Ankle braces come in many shapes and sizes and can be pre-fabricated or custom made. Generally, they can be a good choice of care, especially if surgery is not an option, or perhaps is not wanted. We at Foot Specialists of Greater Cincinnati have the ability to custom make ankle braces for you if the condition warrants it. Often times insurance providers will provide coverage for this therapy, but you may want to call your insurance company first to verify benefits. Give us a call at (859) 341-9900 if you think such therapy may be a choice for you.